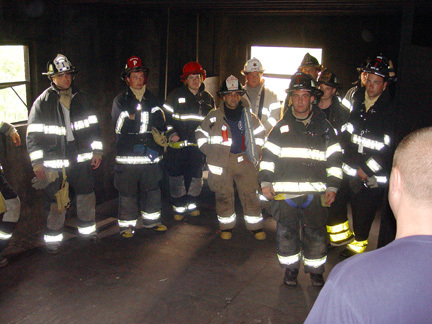 Facing unknown dangers whether in the World Trade Center or a family home, Americas firefighters are trained in search and rescue. 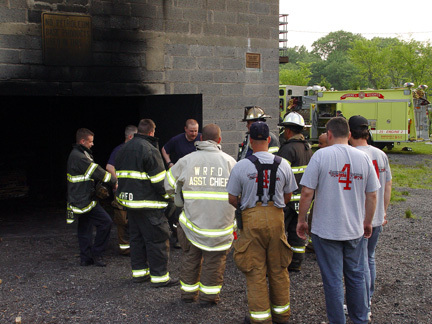 On the evening of June 10, 2005, the volunteers from the Hasbrouck Heights Fire Department, Wood-Ridge Fire Department and Garfield Ladder Company 4 participated in search and rescue training at the Passaic County smokehouse in Wayne, NJ. This three-story concrete building is designed to take firefighters to the edge of endurance. 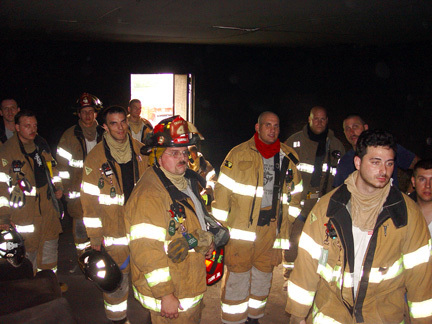 Before the training, firefighters were given a tour of the building. Command was established and an orientation to include safety issues and training goals was presented. For starters, it was a 90 degree evening. 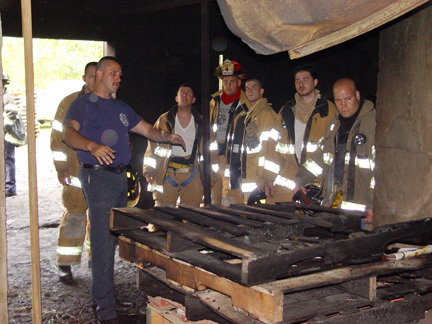 Adding 60 pounds of turnout gear, the "Scott Pack," and tools -- including thermal imaging cameras --test the mettle. 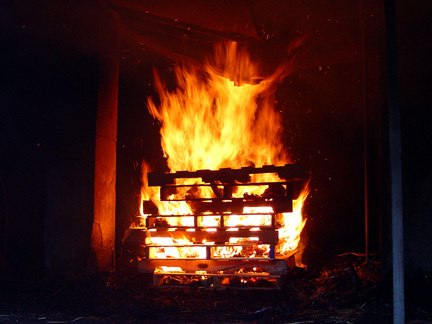 A roaring fire was lit in the basement. 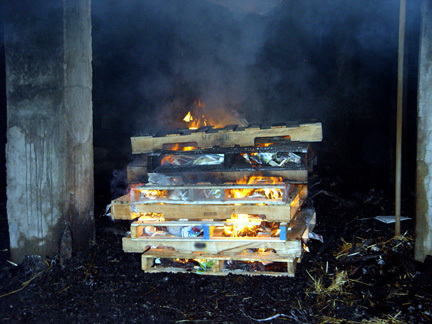 The windows were sealed to contain the smoke and especially the heat. The inside walls were configured and modified each "evolution" to provide realistic obstacles. A "victim" constructed of old fire hose is hidden inside by the instructors. Search and rescue teams then go into the darkened, smoke-filled building. 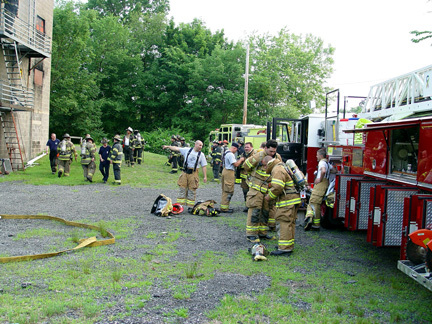 Firefighters from different departments collaborated into search and rescue teams using classic techniques. Several teams would operate simultaneously. What makes these exercises especially grueling is the heat. With a sealed environment, the building gets hotter and hotter to where the seat of the fire in the basement is actually the coolest spot. 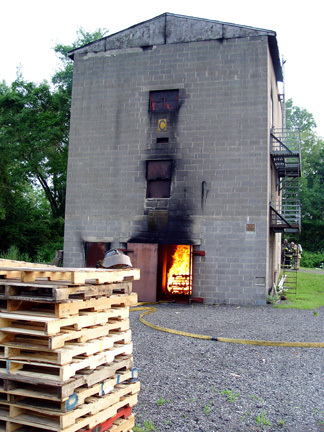 Although this was search and rescue training, hose teams would get into position to attack the seat of the fire -- but would not put the fire out. 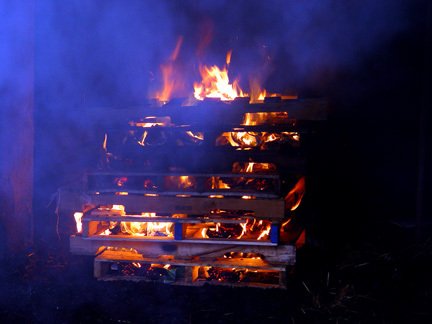 Combustible material was added to keep it roaring and to build the heat to the extreme. Towards the end of the evening the third floor became unreachable -- thus each firefighter tested their personal threshold. 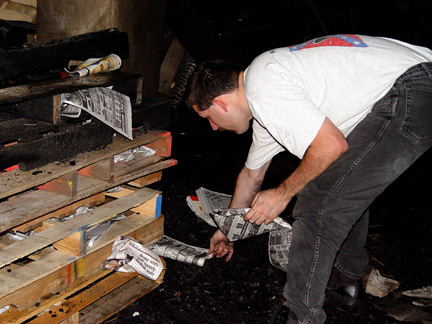 During the final "evolution," it was so hot that firefighters could only last inside for a few minutes before the heat overtook them. Under their protective equipment, they would sweat and the heat was extreme enough to create steam (approximately 120oF) inside their gear. 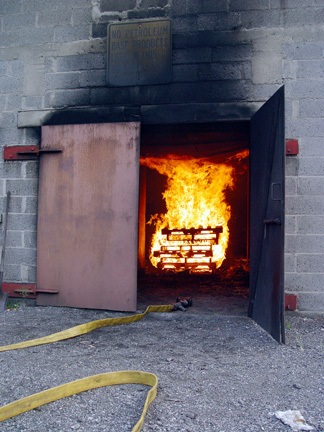 The gear fasteners became so hot that the firefighters could not release them with bare skin and required assistance in taking off the equipment. Shower heads were installed on HHFD Engine 2 to cool down the men, other department members provided cold drinking water and EMS checked blood pressures, vital signs, etc. If it were any hotter, they would not be allowed inside the building, and if they were inside, they would receive the evacuation order.